Don’t let the weather be an issue for your special event – protect your guests with a tent or canopy from Bear Event Services. Renting a tent or canopy for your special event can offer protection from the intense summer heat, the rain and the wind. A tent or canopy will keep your guests comfortable in any weather. Bear Event Services offers tent rentals and canopy rentals in Central Washington, including Yakima, Prosser, Sunnyside, Grandview, Ellensburg, Moses Lake, Wenatchee, Cle Elum, Toppenish, Richand, Pasco and Kennewick. We will deliver just about anywhere. All you need to do is ask! 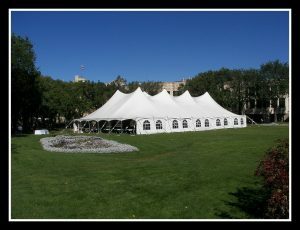 Wedding tent rental in Central Washington has never been easier. We have canopies and tents in a variety of sizes to fit your needs. Let our team setup and tear down your tent or canopy so you can focus on taking care of your guests. To give your tent or canopy rental that extra special touch, consider carpeting, fabric draping and lighting too. We can create a unique look for your tent or canopy rental – just ask and we are happy to provide a complimentary site visit to discuss your ideas, provide recommendations, and make your vision become a reality. Wedding and special event tent rental in Yakima and the entire Central Washington area with Bear Event Services gives you peace of mind with the best customer service in the area. Our teams are on-time, friendly and helpful. Customer satisfaction is our top priority! Return to main Products page.